It sat in a small compact packet, peering out through its transparent seal. I gazed down at its coiled gold body; at first glance, it looked a bit like a sleeping porcupine, all curled up in all its spiky glory. 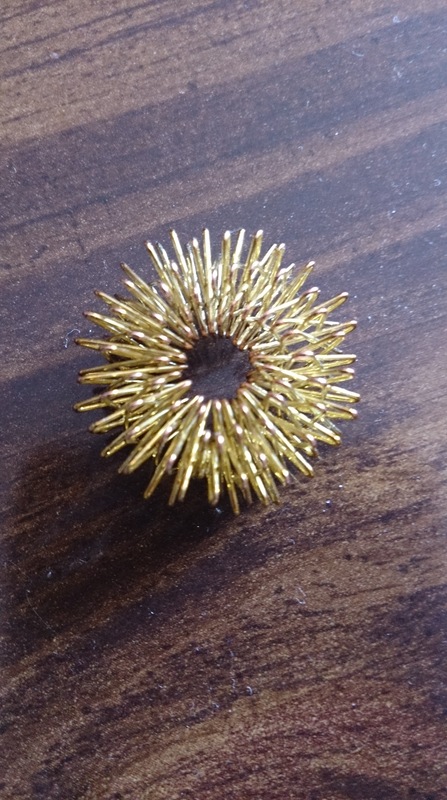 I removed it from its package and found a gilded ring twisted into a perfect circle. But this was not just any ring – this ring had a special purpose – its destiny was to combat the ache of old lady RA in my fingers. I spilled it out into my hand, a tiny golden halo with a special elastic ability – it alters its shape to stretch over each finger, caressing and relieving the ache of arthritis. Its spiny loops generate the perfect mini massage for sore tired fingers. My fingers take on a lot on any given day, gripping, grasping, twisting, typing, and the cold damp weather of the west coast leaches under the skin, adhering to my rusty joints, bringing old lady RA to life, like electricity reviving the Frankenstein monster. My curled finger ring smoothly glides up and down each aching digit, easing tender fingers through gentle pressure delivered by its circular motion. It requires little energy to execute; it’s a mini massage that can be done anywhere. It could even pass as a unique trinket, and then use its special talent when needed. It’s the ring that is never the lonely ring and never gets left behind in the jewellery hutch, no matter how swollen my fingers. 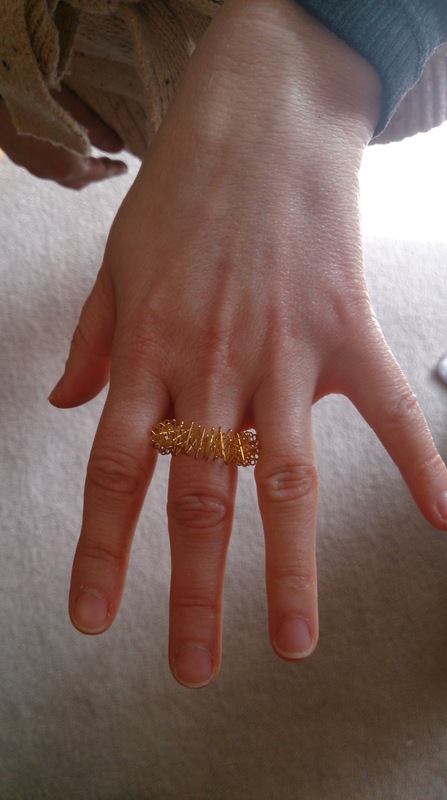 hello – that looks great, and I certainly relate to the ‘lonely ring’ situation : ) where did you get it from? It was a gift, but I believe you should be able to find them in health or medical supply stores – it’s an acupressure ring. I think some people have found it through Google. It’s a lovely little tool for relieving sore fingers. What a wonderful invention! It must be so soothing. I must look for a golden ring myself. I wear several rings; they are my barometer as to how swollen my fingers are on any given day. Hope you are well. Hi Irma, it’s a great little tool. I love it. I think you can find them in health or medical supply stores. I think they call it an acupressure ring. This one was a gift, and I had never seen one before; it’s wonderful for massaging sore fingers. This is not only apparently functional, it’s also beautiful. Thanks for sharing. Carla, they are wonderful little things. A good investment for sore and tired fingers.